Here is the ultimate pumpkin cake! It’s the cake that will make your holiday unforgettable! It’s a delicious, decadent , over the top dessert! Spicy pumpkin cake in four layers, caramel layered between the cake, then topped with a cream cheese buttercream frosting. 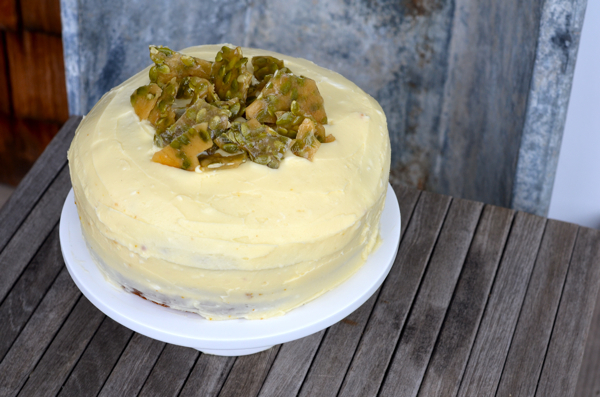 On top of the cake are shards of pepita ( pumpkin seed) brittle. The cake stays moist so you can make it a day in advance and keep covered in the refrigerator. It’s sublime! From by the bay wishing you, pumpkin food memories! To make the cake, in a large bowl, sift together the 2 cups flour, the granulated sugar, baking soda, baking powder, cinnamon, ginger, nutmeg, cloves, cardamom and allspice. In a electric mixer using the paddle attachment combine the pumpkin, sugar and oil. Add eggs one at a time. Mix in orange zest. On low speed add the flour mixture to the flour mixture until just combined. Divide the batter between the prepared pans, spreading it evenly. Bake for 35 to 40 minutes until a tester inserted into the center of a cake comes out clean. Transfer to wire racks and let cool in the pans for 15 minutes. Run a table knife around the edge of the pans to loosen the cakes. Invert the cakes onto the racks and peel off the parchment paper. Let cool completely before frosting the cakes. Place 1 cake layer on a cake plate or platter. Using an offset spatula, spread half of the frosting over the top of the first cake layer. Spread the frosting right to the edge of the top without frosting the sides of the cake. Carefully place the second cake on top, lining up the edges. Spread the remaining frosting over the top of the cake without frosting the sides. Swirl the frosting to decorate the top. Refrigerate the cake to set the frosting. Remove from the refrigerator 30 to 40 minutes before serving. In a medium sauce pan add brown sugar and butter and cook for two minutes on medium heat, melting butter. Add mild and bring to a boil. Take off heat add vanilla, mix and cool. Once cool whisk confectioner’s sugar until good consistency to spread and smooth. Add more sugar until thickened if needed. 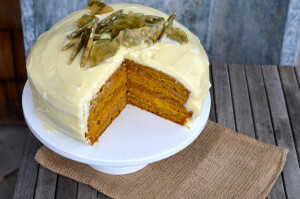 Cut each cooled layer of pumpkin cake in half with a serrated knife. Place first layer on cake stand and using an offset spatula spread on top of cake. Spread the frosting right to the edge of the top without frosting the sides of the cake. Carefully place the second cake on top, lining up the edges.Repeat with the remaining 3 layers. Spread cream cheese buttercream frosting over the top of the cake and sides. Swirl the frosting to decorate the top. Refrigerate the cake to set the frosting. Remove from the refrigerator 30 to 40 minutes before serving.Spread the top and then sides with the cream cheese buttercream frosting. Keep in the fridge until ready to serve. Let come to room temperature. 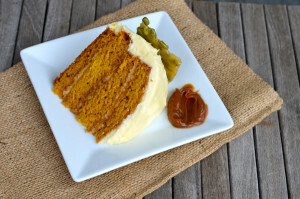 This entry was posted in cakes, desserts and tagged cake recipes, candied pepita recipe, caramel filling, caramel recipes, cream cheese buttercream frosting, pepita brittle, pumpkin cake, pumpkin layer cake with cream cheese buttercream frosting and caramel filling, pumpkin recipes, Thanksgiving recipes on November 24, 2015 by entertainingbythebay.